Jessica and Henry got married in the big beautiful S:t Jacob's church. It was a rainy day full of love. Happy and exciting before the wedding ceremony. 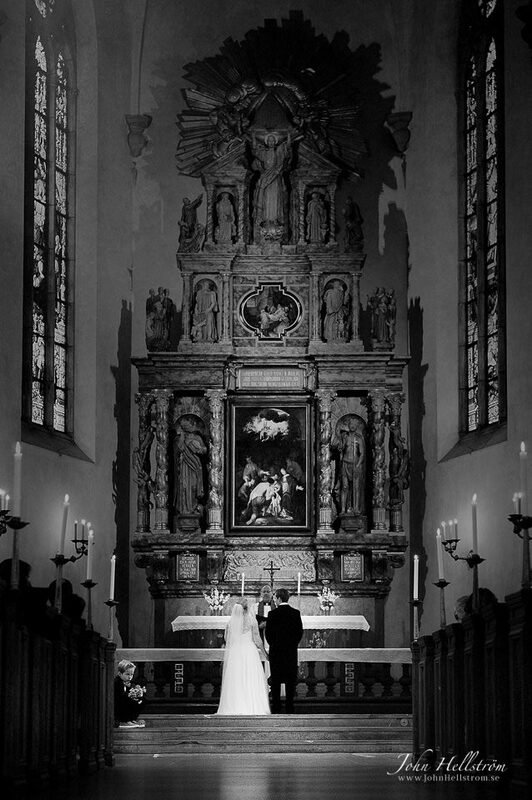 Wedding ceremony in Saint Jacob's church in central Stockholm. In Wikipedia(Eng), it says: "Saint James's Church (Swedish: Sankt Jacobs kyrka) is a church in central Stockholm, Sweden, dedicated to apostle Saint James the Greater, patron saint of travellers. It is often mistakenly called St Jacob's. The confusion arises because Swedish, like many other languages, uses the same name for both James and Jacob. Arguably the most central church in the Swedish capital, surrounded by the popular park Kungsträdgården, the Royal Opera, the square Gustav Adolfs torg; and near Sergels torg, the Royal Palace, and governmental office Rosenbad, the parish of the church was limited to 150 souls in the late 1980s, and was thus merged into the parish of the Stockholm Cathedral in 1989. A bust of Swedish tenor Jussi Björling (1911-1960) stands outside. The church took a long time to complete. As a consequence it includes a wide range of architectural styles, such as Late Gothic, Renaissance and Baroque. The building is based on the design of multiple architects over the centuries: Willem Boy (1580–93), Hans Ferster (1635–43), Göran Joshuae Adelcrantz and Carl Hårleman (1723–35), Carl Möller and Agi Lindegren (1893–94)." We went by boat from central of Stockholm through Edsviken to Bergendal Meetings in Sollentuna, after the ceremony at St. Jacob's Church in Stockholm. The top photograph shows the walk from the boat to the reception meeting at Bergendal Meetings. Toastmaster and madam at the party were Elma and Simon. John Hellström is a portrait and wedding photographer from Stockholm, Sweden.